One of the most relaxing ways of getting from Buenos Aires to Montevideo is to take the three-hour forty-knot Buquebus across the muddy brown waters of the Rio Plate. Naturally one travels First Class, because it’s only marginally more expensive than Tourist, and you get a comfortable lounge and free champagne. 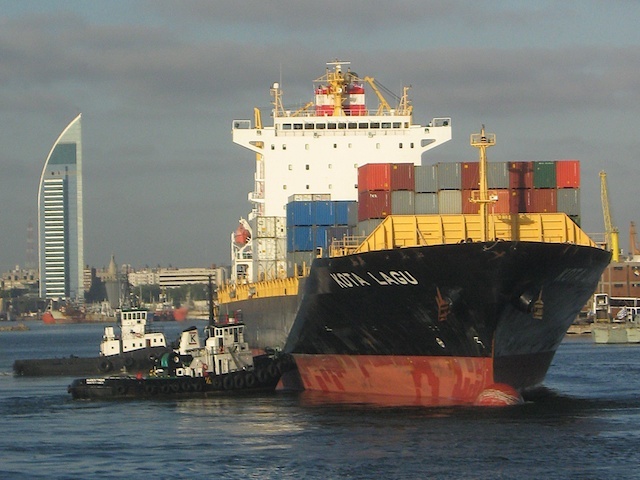 As our high-speed jet boat motored in through the breakwater of Montevideo docks, a bulk carrier was being pushed gently into position by a couple of powerful tug boats, and I noticed that construction of the promised new freight terminal was well under way. It looked to me as if the new terminal would at least double the capacity of the loading dock, and in addition there were no less than two cruise liners in attendance. This pleased me greatly, because one of the reasons that I like the choice of Uruguay as our future home is that I predict a big expansion in its container industry as the world moves away from air freight, and the country´s commodities market expands. 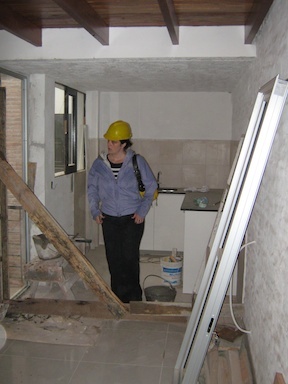 We were here to check up on our building project, a small penthouse in a renovated colonial building, which we were in the middle of purchasing. Our apartment in Montevideo is a renovation project run by a small local building company Viva Tu Casa which specialises in taking old colonial-era buildings, removing all the original mouldings and woodwork, constructing a new building behind the original facade, and then re-incorporating the original materials into the new fabric. We had been impressed by some of their previous work, and had put down a 50% deposit on the largest or penthouse unit of the project of around ten apartments that is known as “Sintonia”. This lies on one of the main thoroughfares through the Parque Rodo district of Montevideo, which we reckoned was a good bet as it is still a bit run down, but sits on the edge of the more prestigious (locals would say “stuck up”) areas such as Pocitos. 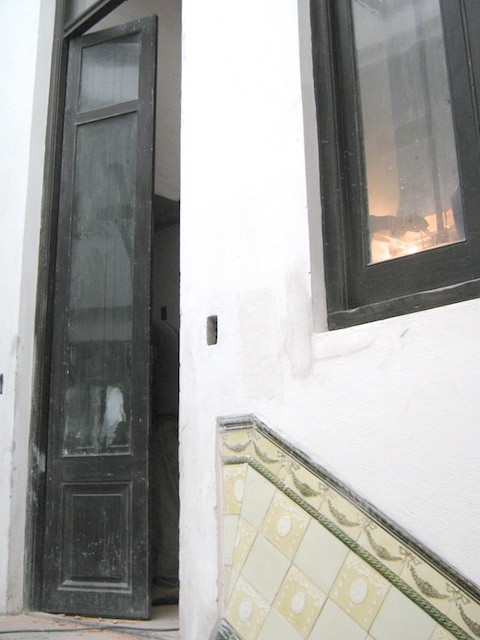 In fact, on our arrival we noted many new building projects in the neighbourhood, all similar restoration projects because the city council has forbidden any changes to the character of the area. They don’t want a repeat of the high-rise transformation of Pocitos. The last time we’d seen Sintonia, it was a hive of construction activity (all labour here is manual, with little or no help from power tools) but lacked a roof and much of the internal structure. We had seen some pictures from a few months ago, when the various floors had been finished but it was still a little hard to see what was going on, but now on our third visit the apartment is almost complete. We climbed the marble stairs in the Italian-tiled entrance hall, lit by an enormous glass-and-wrought-iron skylight, to our four-metre high front doors. This took us to our marble-tiled ground level, with ample living space, more skylights, a “social toilet” and a small kitchen and balcony. Still under construction was the open wooden staircase that will lead up to the bedroom and main bathroom, and on up to the rooftop terraza. In the original design, the second floor of this apartment was to be split into two small bedrooms with a hallway to the bathroom, but we had arranged with the architect to leave the whole thing open-plan, and we were very pleased with the result. 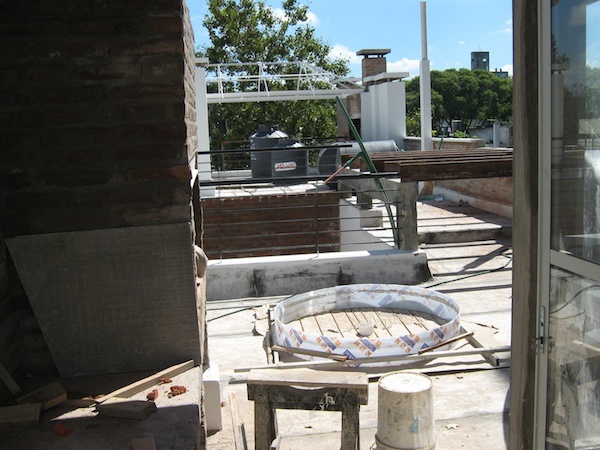 On the roof, amongst a forest of chimneys and glass skylights, we found our parilla (the wood-fired barbecue without which no Uruguayan house is complete), our gas water heater, cold water tank, and lots of space to lounge about in the sun. There remained very little for us to do. The builders were leaving the wooden floor and staircase sanded but unlacquered so that we could choose our own finish, and so we organised a quotation from a floor-polisher who happened to be standing nearby. 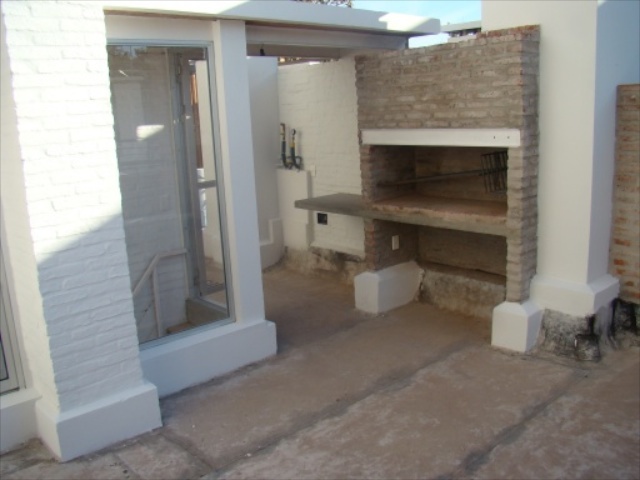 Saul, the owner of Viva Tu Casa, drove us around to a couple of dealers and we chose a wood-fired heating stove for the lounge. We just need for the builders to finish the stairs, complete work on the lounge window, install the electrical fittings and clean up. A couple of the smaller apartments are already complete, so we got to meet one of our new neighbours, and got a sneak preview of the finished product, with which we were duly impressed. The sad part, of course, is that we won’t actually be able to move in when it’s finished. Not only is it time to get back to the yacht and start our sailing trip, but we don’t know what the future holds, and so somewhat regretfully we have arranged for the apartment to be rented out for the next couple of years until we have a better idea of what we are going to do next. This might cramp our options a little (Uruguay is a very cheap place to live if we run into financial problems), but we really didn’t want to leave the apartment empty for what could be a span of years, and in our newly unemployed state it’s likely that we will value the rental income. 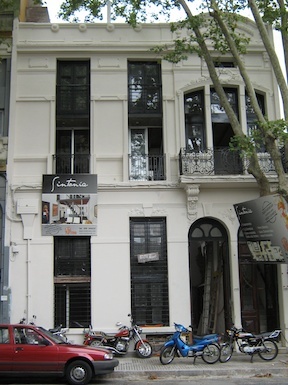 This entry was posted in Americas, Penthouse in Montevideo, Travel, Uruguay on 2009/03/07 by Reinhard. It looks fab – you must be really pleased!